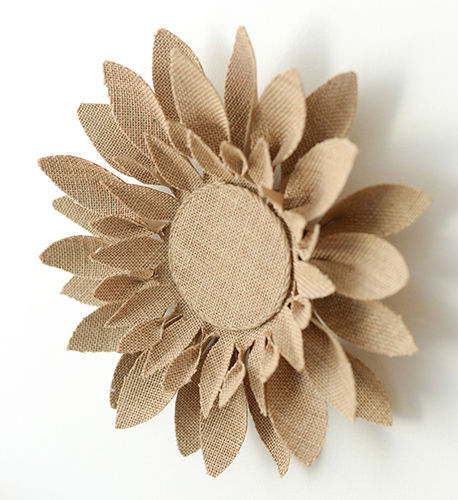 Whether you are looking for something to accent your current wall décor, need to create some custom party decorations, or just want a fun project to complete, the burlap sunflower is a great place to start! Using the template cut three large petal flower shapes from the burlap. *Note: do not cut the circle from the center. Using the template cut two small petal flower shapes from the burlap. Put a dot of hot glue at the base of a petal. Pinchtogether. Repeat thisprocess for every other small petal. Repeat step 3, this time with each large petal. Layer the flower shapes together with the larger flowers at the bottom and the smaller flowers on top. Adhere in place. Cut a burlap circle using the center of the large flower template as a guide. Cut a circle that is slightly smaller using the dimensional foam. Adhere these two together and add the grouping to the center of the flowers from step 5. Embellish the flower with jute rope. If the burlap starts to fray, add a thin line of glue or clear nail polish to the outsides to stop it from unraveling any further. Sharp scissors work best with the burlap.